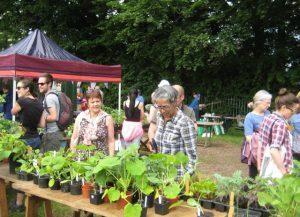 We had our annual plant bring and buy sale on Sunday, 4 June and it was a huge success. We had our 2017 plant bring and buy sale on Sunday, 4 June, in our car park area, and it was a great success in all ways. The set-up at the beginning and putting-away at the end went very smoothly, with plenty of volunteers who worked together and got it all done really quickly. There were huge crowds waiting to come in and buy stuff, many from outside the allotments (good publicity!). 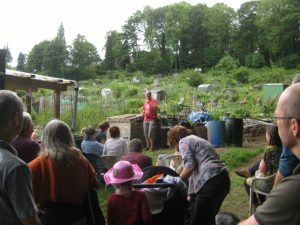 Lots of people listened to “Compost John” give his famous talk on composting everything – yes, everything. There were more really healthy looking plants on sale than I can ever remember. The refreshments were delicious, and finally, everyone seemed to be enjoying themselves enormously. Oh, and we made over £450 towards our allotment funds. Big thanks to everyone who helped out in any way (lots of you! ), or who just came along. It was all great fun!